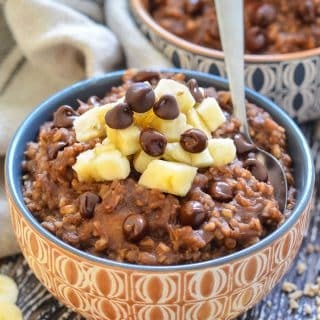 Satisfying & nourishing Healthy Chocolate Instant Pot Steel Cut Oats. Quick to make, simple & naturally sweetened with banana only. There is no added sugar at all! Just perfect for a hearty breakfast. And if you don’t have an Instant Pot you can make them on the stove-top instead! Steel cut oatmeal is one of my favourite and most often eaten breakfasts, but I have to be careful because I have a very sweet tooth. I find it all too easy to add way more than a drizzle of maple syrup, or a few too many tablespoons of coconut sugar. Add chocolate to the mix too and things can easily get out of hand. Not that I mind that on occasion, but for every day eating I need to be sensible. I still want sweet oatmeal though, preferably with chocolate too (because that’s how I roll ????.) That’s where my Healthy Chocolate Instant Pot Steel Cut Oats come in! You can have your cake oatmeal and eat it too! Throughout the summer I tend to eat overnight oats made with rolled oats for breakfast. 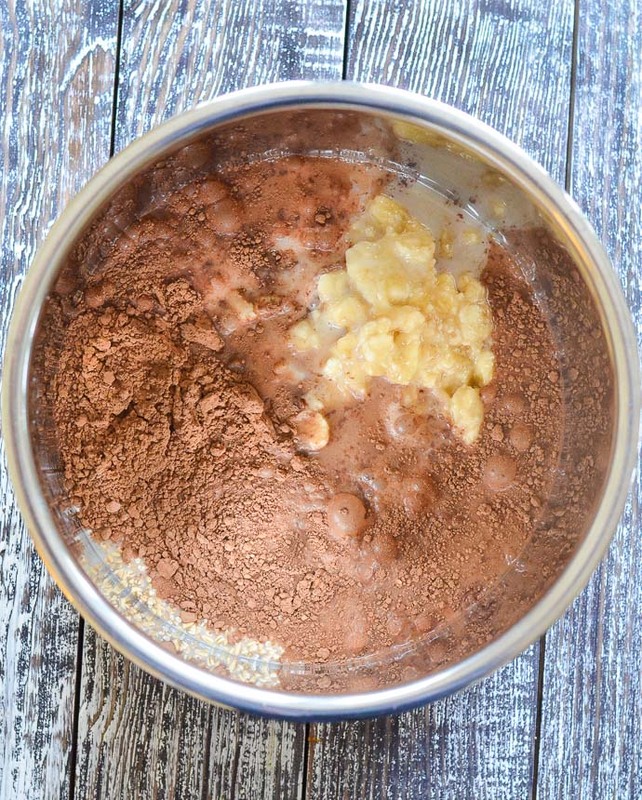 My Ginger Chocolate Overnight Oats are my favourite. In the cooler months I start cooking the oats again and when I do, I much prefer the texture of steel cut oats. They have more bite, plus they keep you feeling fuller for even longer. 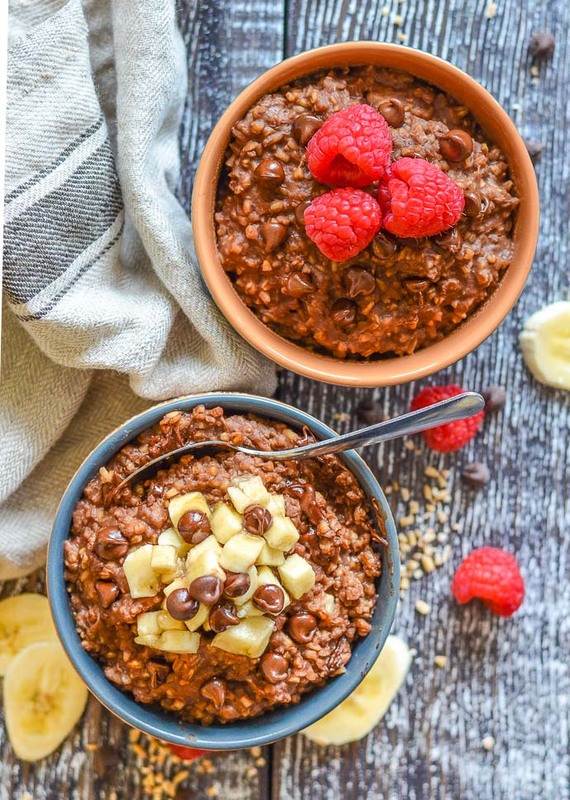 That’s why I use steel cut oats in this Healthy Chocolate Instant Pot Steel Cut Oats recipe. Whereas with rolled oats, the groats are first steamed to make them slightly softer, then pressed to make the characteristic flake type pieces, steel cut oats are made simply by chopping the whole groats into pieces. They are a little less processed and have a slightly lower glycemic index than rolled oats. They also take longer to digest so keep you feeling fuller for longer. Steel cut oats look almost like chopped up pieces of rice. They have a slightly nutty flavour, a really nice, chewy texture and they hold their shape well even after being cooked. I prefer them to rolled oats because of the texture and because they really do keep me feeling full for longer. 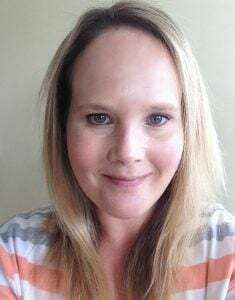 The little Instant Pot pic is an affiliate link – if you buy through it I get a small commission which goes towards keeping A Virtual Vegan up and running . It doesn’t cost you any more though ???? There are all kind of fancy, newer versions, even some with bluetooth, but this one had all the functions I needed and is a lot more budget friendly than the newer models. Why spend more if you don’t have to? I’ve used it literally every day since I’ve had it. 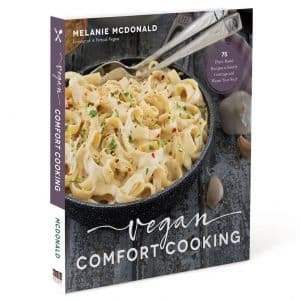 They cook incredibly quickly and they also have a slow cooker function. You can sauté in them which really cuts down on the clear up as you don’t need to use a separate pan. They cook grains perfectly, are great for cooking chilis, curry, soups, stews, beans and lentils. They can steam, make yogurt, I’ve even used mine to proof bread when I was in a hurry one day. They also make perfect oatmeal with absolutely no need to stir throughout which I love. I just set and forget for 10 minutes, wait for the pressure to release and breakfast is done. JUST 4 INGREDIENTS & NO ADDED SUGAR! Thanks to the banana, they need absolutely no sweetener. I can’t take credit for this idea. Veggie Inspired has been doing it for ages in her Easy, Sweet, Creamy, Customizable Healthy Oatmeal and that is what gave me the inspiration for this recipe. 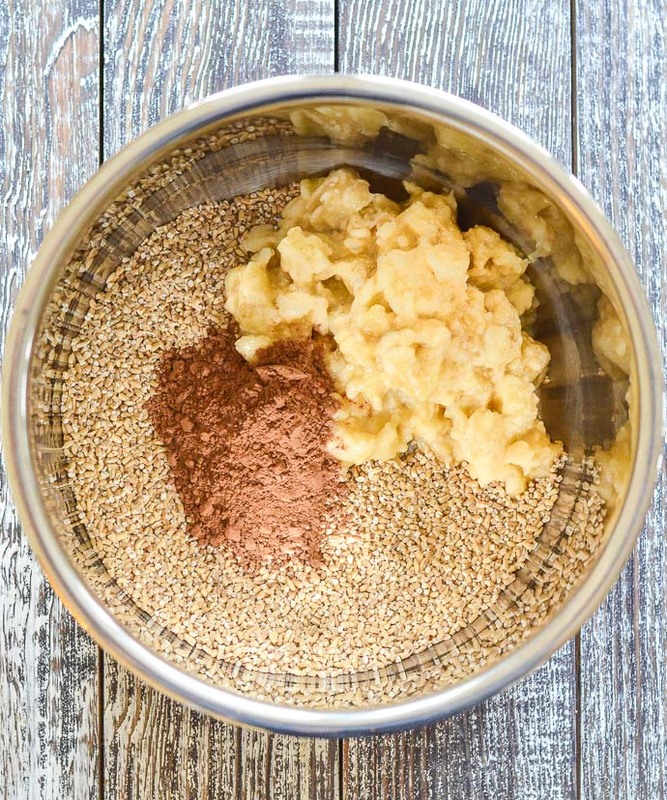 It’s such a great idea and I really wanted to see how it worked in my Instant Pot Steel Cut Oats. Of course I had to add some chocolate flavour in the form of cocoa too. Because…Well…Chocolate. You know how obsessed I am. ???? 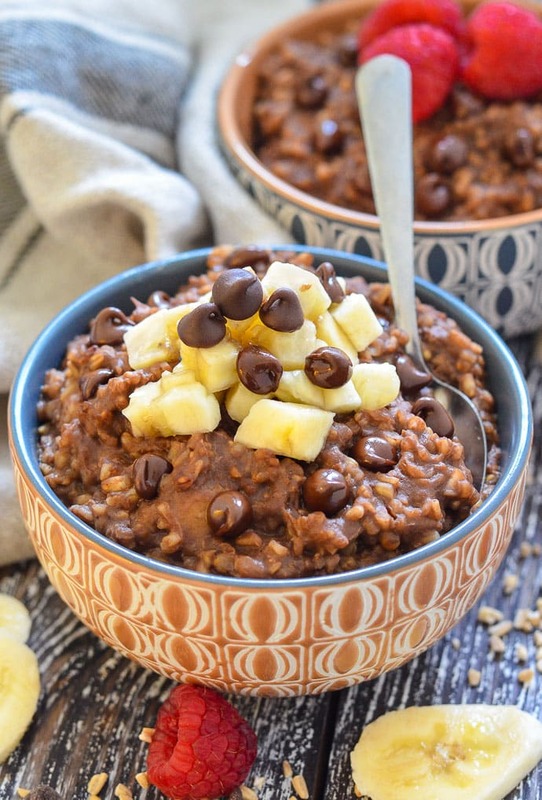 I like to cook a big batch of these Healthy Chocolate Instant Pot Steel Cut Oats once a week. I then portion them out and store in the fridge. It can get a bit stodgy once cold, but add a bit more milk, give it a stir and warm through either in a pan or in the microwave and it’s good as new. However you top them, I’m sure you will love them! All of my recipes are tested meticulously before coming to the blog, including this one. However, I did only have one Instant Pot so could only test this recipe in that one machine, and it seems that some are more finicky than others. It worked perfectly for me every-time and I make this recipe a lot, but after receiving some reader feedback regarding your Instant Pots not coming to pressure, or giving the dreaded “BURN” message, I purchased another one and temporarily stole a friends so that I could re-test this recipe. As a result of those tests I have amended the recipe a tiny bit to include more liquid and a note to add the banana last and not stir it in. It seems that the thick banana on the bottom of the pot was what may have been causing issues for some of you. Hopefully my amended instructions will solve the problem. These changes were made on July 7th 2018. 3½ cups / 840 mls / 28 fl oz water , or use half non-dairy milk, half water. If you are NOT vegan please see recipe note. Add the oats, water and cocoa to the Instant Pot and stir well. Mash the bananas with a fork until a puree. A few small chunks are ok. Add them on top of the other ingredients and DO NOT stir. Put the lid on, make sure the steam vent is sealed and set to manual, high pressure, for 9 minutes. Then leave the pressure to release naturally. Once the pressure has been released and the pin has dropped, remove the lid and stir the oatmeal really well before serving. It will thicken up as it cools. You can add more water or milk before serving for a looser texture if you want. 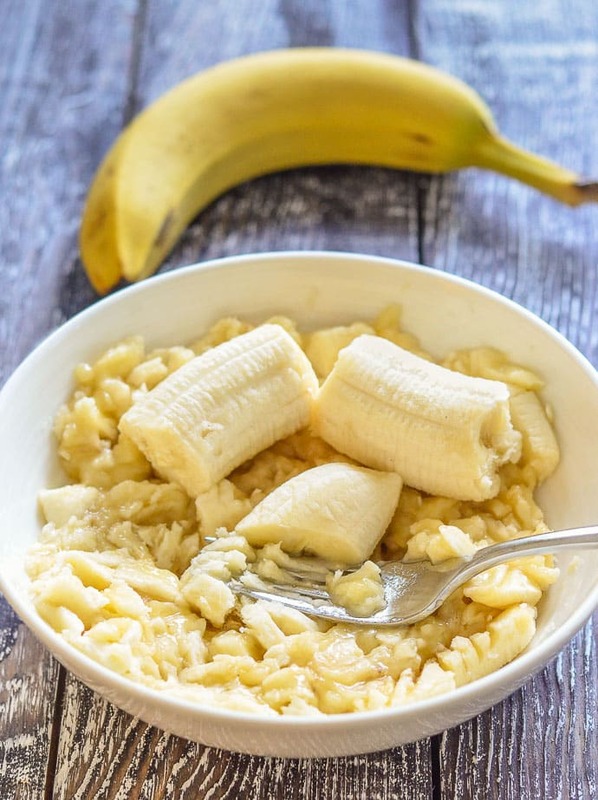 Mash the bananas with a fork until a puree. A few small chunks are ok. Add the banana, oats, milk/water and cocoa to a pan and bring to a simmer then turn down to medium-low and cook for around 20 minutes, stirring frequently. Because evaporation will occur in the pan, unlike in the Instant Pot, you might need to add a little more milk or water as it cooks if it gets too thick. Just add enough to get it to the consistency that you like. Once thick and creamy, turn off the heat and serve. 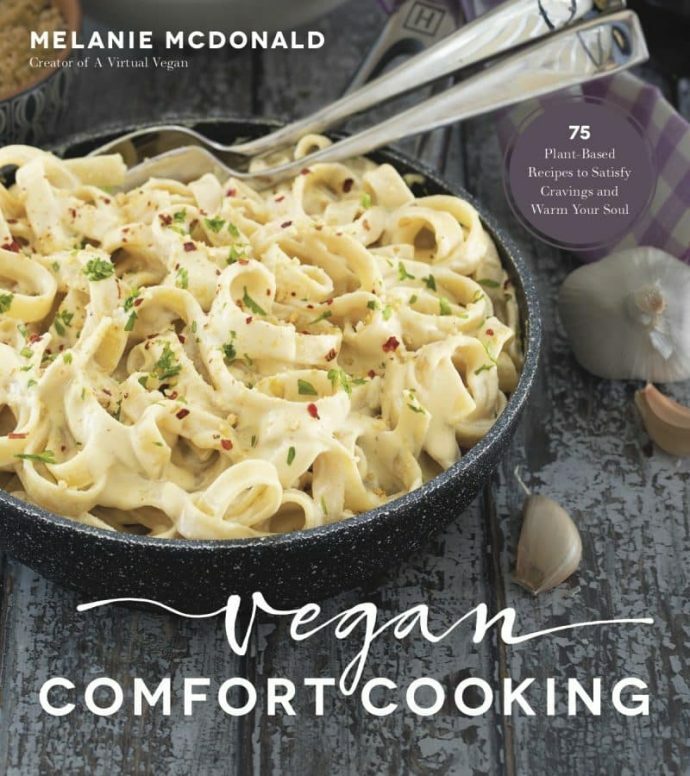 If you are not vegan and you are making this recipe, do not use cow's milk (or other animal's milk) in this recipe. It will likely scorch and cause the oatmeal to burn or the IP to not come to pressure. it is better to use all water if you do not have some non-dairy milk. Calories are calculated using ½ Silk Unsweetened Cashew Milk and ½ water. Officially a serving of steel cut oats is ¼ cup dried so this recipe 'officially' serves 4. I personally think that it's more like 3 ??? ?.